Join WIPR and RWS IP Services for a complimentary webinar as we discuss patent filing strategies in China. As the largest growing consumer market in the world, enforcing your intellectual property (IP) in China has become increasingly critical. 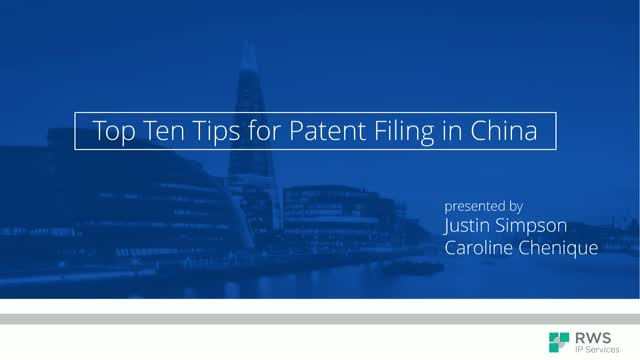 In this webinar, we will discuss the ten steps your organization should take when seeking patent protection and help you formulate your commercial IP strategy. In this webinar, we'll discuss the best approaches to IP portfolio management, hearing from industry on what they consider best practice and looking at potential solutions to help you manage your portfolio effectively. As IP rights increase in importance to businesses, so do the threats to them, the costs of maintaining them, and the complexity of making good decisions about how to direct and manage them. This webinar will help you understand what strategies are available, and how to ensure that portfolio management is resource and cost-effective in your organisation. CRISPR gene-editing continues to hit the headlines regularly as a ground-breaking technology with many millions now flowing into companies seeking to exploit the technology in both the therapeutic and agricultural fields. Unfortunately, the IP landscape continues to lack clarity with possibility of divergence between Europe and the US. This webinar is aimed at those wishing to hear about the latest developments in the CRISPR IP landscape whether in the commercial, academic, legal or patent world. With the CRISPR IP saga seemingly not close to the final chapter, it will also provide an opportunity to raise questions which may arise from the on–going lack of clarity. The UK Supreme Court's 2017 decision in Actavis v Eli Lilly introduced a doctrine of equivalents into UK law. In this webinar, we'll discuss the implications of that decision and look at how it is being applied in other cases in the UK courts. Personalised healthcare (sometimes referred to as precision medicine) is an evolving field in medicine where a therapeutic treatment is tailored to an individual with a particular disease. The patenting of personalised healthcare inventions has proved problematic in a number of jurisdictions, most notably the USA. However, various aspects of these inventions are patentable in Europe. This webinar will set the scene as to what personalised healthcare is and will run through the history of second medical use patenting in Europe. Discussing key cases such as G5/83, T1020/03 and G2/08. It will then focus on how second medical use patenting can be applied to personalised healthcare inventions and will give examples of claim language that is finding favour at the EPO. This webinar will be on opposition and appeals practice before the EPO. We’ll be discussing the streamlining of the opposition procedure by the EPO, the changes that we are seeing as a result and will be providing practical tips in view of these changes. The talk will also draw on recent case law. Over the last 10 years, multiple patents on therapeutic antibodies have been invalidated in the courts, often for lack of written description. Many other cases are working their way through the courts and the PTAB. This webinar will review major CAFC and PTAB decisions affecting therapeutic antibodies and will explore the best ways to obtain valuable and enforceable patents on therapeutic antibodies. The main issues to be covered are Section 101 issues (laws of nature, natural phenomena and natural products), obviousness and written description. With the year approaching its end, many IP departments will be looking at how best to rationalise their work for 2018. This webinar explores how to ensure your trademark portfolio is in the best possible shape using a two part verification and audit process to save you time and money on your IP assets, as well as analyzing your current and planned costs and guiding your filing strategy in the new year. This webinar will cover the current state of play in Europe regarding biotech patentability issues, including recent case law on what data you need to make an invention in this area plausible. It will also look at how recent rule changes have influenced patentability of plants and animals before the EPO. Finally, we will compare patentability practice in different jurisdictions around the world, most notably in the US, China and Japan. WIPR and Brandstock present this one hour webinar looking at IP recordals projects and the challenges brands face when undertaking this kind of work. The US Supreme Court's recent decision in Halo Electronics, Inc. v. Pulse Electronics, Inc has big implications. This one-hour webinar will briefly address the history of willful infringement and the obligations to avoid infringement before and after the Seagate decision and as changed by Halo. It will also focus on how to best establish good faith with a non-infringement/invalidity position post-Halo including where a product was introduced post-Seagate and prior to Halo. The CRISPR IP landscape in Europe is very murky. Listeners will gain an understanding of the current situation, which will aid them to make licensing decisions if and when they intend to commercialise. This 45-minute webinar will provide an up to date analysis of the current state of play in Europe with comparison to the state of play in the US. One of the main challenges companies face with their trademarks is managing business risk effectively. In this on-hour webinar, we hear from leading brands about how they minimise risk by developing smarter search strategies to ensure that their trademark portfolios are robust and effective. Challenging patents involving unpredictable technologies for obviousness is particularly difficult due to the well-established factor of “reasonable expectation of success” and the related KSR factor of “limited number of predictable solutions”. This webinar, presented by attorneys that have successfully argued on both sides of this issue for chem/pharma/bio patents, will discuss two to three leading PTAB decisions, including related appeals, that illustrate when obviousness challenges have and have not been successful. The case discussions will provide (1) a summary of the documentary evidence relied on, including critical excerpts from that evidence, (2) a summary of the “story” that was being told by each party and (3) the role that expert testimony appeared to play in the PTAB decisions. This one-hour seminar will also briefly explore what types of cases are better challenged in court and what types of cases are better challenged at the PTAB. The goals of the seminar are to allow parties to evaluate the chances of success for a contemplated or recently filed PTAB challenge and to help parties to a PTAB proceeding develop a record to support their respective positions. CLE available. When the Federal Circuit last year effectively struck down the portion of section 2(a) of the Lanham Act that bars so-called ‘disparaging’ trademarks in the US, it paved the way for a potential Supreme Court review of the issue. In this webinar, we discuss the implications of the decision, the case that prompted it, The Redskins, The Slants and other potentially ‘disparaging’ trademarks, and the implications for US practice. Robert Kenney and John Ferman from Birch Stewart Kolasch & Birch and Professor Steven D. Jamar from the Howard IP Program are joined by Peter Scott, to consider this controversial issue. We hope you’ll join us for a lively debate.